After years of research and battles on strange and far away planets Cell Medusa reunites aboard the Fury Untold. In orbit above Snope's World they raise a glass of amasec and regale their fellows with stories of their trials. The years spent tracking the Patternari Cabal had finally revealed their intentions. The rise of an ancient and terrible xenos threat was imminent and the Cabal intends to use the vast warp storm known as 'the Surge' to stop them. Led by the research of the late Inquisitor Khlor Durran and assisted by Inquisitor Goldspire and his acolyte, Inquisitor Malachi had predicted the storm years ahead and put machinations in place to bolster its power. All the heresies Grendel's warband had quashed were part of Malachi's plans and as the Surge comes to power his conspiracy comes to fruition. The Surge would destroy Askellon but the Necrontyr threat would be resolved. The civilisation in Askellon would be destroyed by the greater Imperium saved. All evidence points to the Patternari operating within the Angel KZ-8 system in the Thule subsector. Setting off from Snope's World the Fury Untold travels towards Angel, following the hidden coordinates left by Navigator House Auriga centuries ago. As the Surge cuts off contact across Askellon the Fury enters the warp, burning towards Angel to find the Patternari before it is too late. Finally, at long last, the way is clear to you. Far off of the rimward edge of the Thule Sub-Sector, the lost-system of Angel KZ-8 awaits. Grim-faced and determined, the Fury and her crew prep the ship the long voyage into the unknown reaches. In the war-room, Grendel addresses his collected agents and acolytes. With a wave of Grendel's hand the waiting hololith thrums to life, casting you all in a deep emerald glow. On the Fifth Angel of Thule will you find the Ring through which death stalks the empire of Man. Aboard the Fury Untold a force not mustered for years prepares to assault Angel KZ-8. Inquisitors Grendel and Sabela had called in all their resources and favours in order to crush the Patternari Cabal. The three Interrogators would lead the assault, commanding Cells Raptor, Alloy and Medusa. Interrogator King would land with Agents Wolffe and Mercutio, her twin assassins Simil and Simala and the Burrard PDF Marksman Eldron. Interrogator Castus would lead an assault force of Arbites, an elite capture squad recruited from Desoleum. His responsibility would be to capture Caprican Malachi alive. The main brunt of the force would be commanded by Interrogator Gallach with Cell Medusa, Gavriel Zane and Lazarus Hayl, by his side. The assault would be bolstered by a Skitarii squadron led by Gnaritas Seculis, mounted soldiers in matte-red rhino tanks and a full company of Burrard Penitent Legion. After a request from the Deathwatch a single Astartes also agreed to join Inquisitor Grendel's forces. Brother Sigmus of the Pandemonium Wardens arrived alone already wearing his yellow battle armour and will easily be worth 100 Imperial Guardsman in the struggle to come. After weeks in warp the tension settles onto everyone aboard like a cloud. Everyone on the Fury knew what their task was and the importance of the battles they would have to come. As preparations continue aboard the warning klaxons begin to sound. At first it seems like a usual warp alarm but suddenly a second wailing klaxon sounds. The gellar field failure alarm. The crew jump to battle stations as the shallow shield protecting the ship from the warp stretches and then pops. Gibbering laughter fills the halls of the ship as random armsmen suffer warp phenomena. Captain Drake orders an emergency detranslation and with a lurch the ship jumps back into reality. As it plunges back into realspace there is a ripping of steel so loud it deafens crew stationed along the outer decks. The Fury Untold bursts back into reality but it breaks her. Fractures run along the full length of the ship, the backbone of the ship shattered and her voidshields overloaded by the energy. And worst of all the alarms ring out still, the ship due to retranslate into the warp in mere minutes. Seeping plasma energy from the broken reactor and venting across the ship a wounded Captain Drake gets on the vox: "Retranslation imminent. The ship is lost. Abandon ship…say again….abandon ship". Rushing through the corridors of the Fury Untold Cell Medusa get what equipment they can from the Hub and rush for the hanger bay. When they arrive it is already swarming with crew attempting to take landers to escape. At the back of the gun-cutter a half dozen bodies lie still, crewman who tried to commandeer the ship and were cut down by Tarl's heavy blade. Boarding the cutter Cell Medusa prepare to leave as Gallach dashes across the crowded hanger to the door controls. Releasing the outer door the gun-cutter swings past and picks him up. Burning out of the hanger bay the gun-cutter joins a half dozen other ships in the void, a score more emergency drop pods launching from the Fury towards a barren grey-brown world some distance away. With Nimm at the controls the cutter swoops away from the ship as a purple light begins to glow from around the Fury. A warp portal, used by ships to enter the immaterium, begins to form around the ship, driven by her malfunctioning warp drive. But the ship's gellar fields are down and it is pulled slowly and terrifyingly into the maddening maw of the warp. As the gate closed a wash of energy swarms outwards, a backlash of the thousands of souls consumed by the warp. As the wave of purple energy washes over the fleeing crew the members of Cell Medusa fall unconscious. Minutes or possibly hours later Gavriel awakes within the confines of the cutter, lit by red emergency lighting. Rousing the others they find the cutter without power but the rest of the Cell mostly unharmed. The enginseer, Cil-848, goes below to re-power the engine from his personal luminen capacitors while Nimm gets on the vox and tries to contact any survivors from the ship. As the lights and augurs come back online the Cell makes an awful discovery. The few souls who had managed to survive the destruction of the Fury had all been caught in the warp backlash, minds burned out or worse by the horrible swarm of energy. Only the proximity of null Ludek and the armour of the cutter had allowed them to survive and even the warship was heavily damaged. The cutter scans the nearby area, looking for a way to repair the damage to the ship. The nearby barren planet brings no relief, the ship too damaged to break atmosphere. But the long range scanners do pick up a strange structure in space around the fifth planet of this system. In a last ditch attempt Gavriel reaches out his mind looking for survivors. Grendel, Sabela, anyone. But the area is quiet. The crew of the Fury, the assembled forces and the hope for surviving against the necrontyr threat were all gone. Running on emergency power the gun-cutter flies towards the unknown object, finding on closer inspect that it is an Imperial watch-station. A relay post for information it appears to be long abandoned and the Cell dock and proceed in voidsuits into the interior. Walking the long abandoned corridors they find no evidence of its previous owners or their fate, the life support manually deactivated years ago. Only the bridge has power and magboots clinking on the steel grating they make their way towards it. Hayl easily hacks through the bridge's security system and the Cell walk into a room beyond, removing their helmets and breathing in the stale air. As they enter a figure on the station's command throne stands and turns towards them. A tall and lithe figure in a black robe looks out at them from beneath a skull mask all three of the Agents recognise. It is the face of their target; the rogue Inquisitor Caprican Malachi. Malachi, heretical leader of the Patternari Cabal and master psyker stands before Medusa Cell as they raise their weapons. He speaks to them as if they didn't have weapons trailed on him. He explains that everything up until now has been as he predicted but that from this moment onwards he sees nothing. He knows his death his here and that the acolytes would be the ones to fulfil his destiny and stop the rise of the Necrontyr. He helps as he can now, knowing the part he has to play is over. He confirms Gallach's suspicions about the rise of the Necrons and the manipulation of the Surge in an attempt to delay them. He also confirms that all the events leading up to here were intended to force the Imperium to defend locations where he has predicted the Necrons would attack. The Rogue Trader House Rosh and Adeptus Mechanicus still feud above Vanth, their ships in a position to slow a rimward attack. As a response to the Killing Smile virus Desoleum is under martial law, most of the population drafted into the Desoleum PDF. The war on Burrard II is over, the planet united to resist a push from the Necrons into their sector. Kalto is under Imperial Guard jurisdiction, occupied by the Terminus Watchdogs. The Navy blockade Hulee V. Port Lokhart in the hands of a competent commander, Port Aquila hosting the Rogue Trader fleets as they discuss a new combine. Even the war on Temperance means millions of Sons of Temperance are armed and ready to fight. Every heresy perpetrated by the Patternari has been intended to leave the Imperium better off the defend against the Necrontyr threat. Hayl is almost impressed by Malachi's foresight while the Inquisitor makes jibes about Gallach's predictability as he raises his storm bolter. His intentions may have been to help the Imperium but he has committed countless heresies in order to do so. A single bolt round shatters his mask and explodes the head within. The most powerful psyker in the sector, an Alpha diviner, dies as Gallach declares him Excommunicatus Traitorus. Searching the room the Cell finds instructions and equipment to repair the gun-cutter and a map of the surface of the nearby planet, revealed now to be the fifth planet of the Angel KZ-8 system. Malachi's final gift to them, a map that leads to the gate through which the Necron threat would appear. Searching the rest of the station, named Nostrodamus, the Cell repair the gun-cutter over the next day and head down to the planet, searching for the ruins identified by Malachi as their next objective. Gavriel ducked behind the stone pillar just as the arc of green energy seared across its surface, turning it to glass. He dove sideways across a chasm, firing his bolt pistol in flight and cleanly taking the knee off one of the creatures before rolling back into cover behind another rock. Green energy darts past him as he lands, the xenos barely slowed by the incredible amount of fire the Cell had produced in an opening salvo. The newly repaired cutter shudders as it breaks through the perpetual rainstorm in the skies above the fifth planet of the system known as Angel KZ-8. Both Gallach and Nimm struggle at the controls as Gavriel psychically scans the lands below. He senses thousands of life forms, although all record insist the Angel system is unoccupied. Soaring above the jungle the cutter pulls in atop an ancient stone ruin, engines throwing back trees and skeletons covering the ground around the ruins. As Medusa deploys to the top of the ruins Gavriel's life forms appear at the edge of the jungle. Strange hunchbacks with charred black skin rush forward, lunging over the bones of their fellows slain long ago. 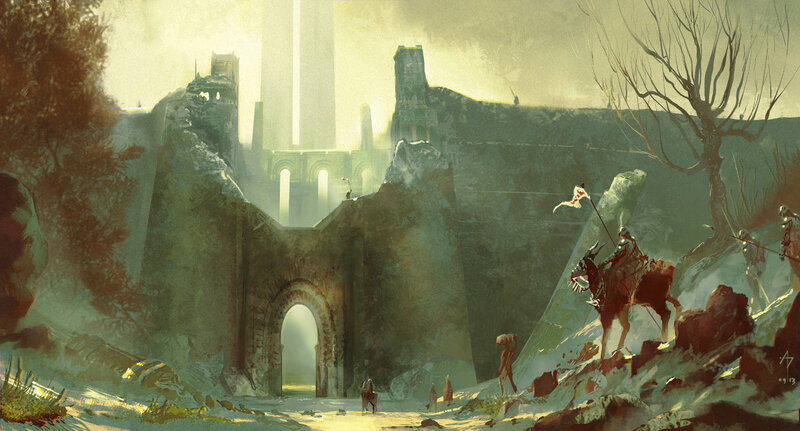 The gun-cutter pulls away, heavy bolters raking the strange creatures as they clamber up the sides of the ruins. Thousands of the proto-humans clamber up the ruins, forcing the Cell to jam the iron doors of the ruins closed behind them. The cutter pulls away, strafing the creatures one last time as Cell Medusa descend deeper into the lost ruins of Angel KZ-8. 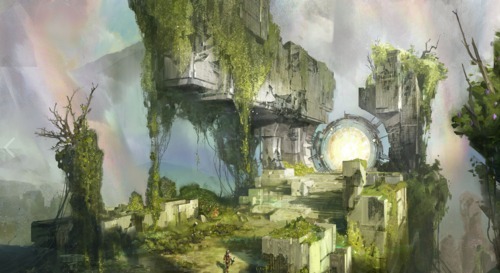 The ruins are ancient grey-brown stone, carved a millennia ago to venerate or contain the xenos relics within. Passing deeper into the ruins the Cell comes across remnants of those who came to Angel before them. The landing party of Navigator House Auriga are little but skeletons, scorched and twisted carapace armour bearing their stylised eye. Moving through mossy stone halls the Cell comes upon more bodies. An imperial guard sniper and robed figure bearing a battle-psyker's staff appear to have fallen breaching into a large chamber while more bodies surround a shattered gate made of strange steel. These men wear light brown robes and the sigil of the Cult of Zadok. Knowing the research conducted by the cult Hayl collects books and data-slates from these skeletons and the Cell pushes on. Finally moving out of a corridor the group arrives at a set of large stairs leading up towards a still standing gate. The iron of the circle has strange green glyphs around the outside and the area is covered in bodies. Spreading out to search the area the Cell determines that these bodies come from three main sources. The Cult of Zadok are also present here, the heretics no match for whatever protects this place. Alongside them lie the bodies of more Inquisitorial agents, unique men and women fallen in protection of an unknown master. A third group makes up the most recent bodies, carapace armoured guardsmen kitted out for fighting Necrontyr. From their bodies the Cell recovers a brace of krak grenades, a launcher and a melta pistol. Gallach also retrieves a weapon of unknown make from the red-robed body of a fallen Tech Adept. As the Cell search through the bodies surrounding the gate it begins to shimmer. With a massive energy surge the gate fills with a strange green energy. Through the energy step a half dozen figures, steel skeletons with arms formed into long rifles. These rifles begin to spit out emerald energy as the creature advance, the blasts leaving long scars on the stonework around the portal as they walk down the steps towards the Acolytes. The Necrontyr were finally revealing themselves but the Inquisition had not been idle. After extensive drilling aboard the Fury Untold the Cell leap to action, following the instructions passed on to them by the Deathwatch Astartes. Gavriel and Gallach target the creature's legs, blowing them out with bolter rounds as Hayl summons his holy aquila. As the creatures fall to the ground they continue firing, pulling themselves along the stones. Where bolt rounds hit the iron of the creatures turns to liquid and begins to reform, the damaged Necrons healing themselves and returning to the battle. As Gavriel and Gallach intensify their fire Hayl rushes forward, placing his hand on their heads and melting them with a sizzling burst of white light. The battle lasts less than 30 seconds. The xenos are slain but Tarl, Gallach's bodyguard, lies still on the ground. The fearsome green energy of the Necrons had burned across his chest leaving him struggling for life. As the gate shimmers again the Cell leap into action. Reloading weapons they step into the shimmering portal…and out into a similar chamber. The stone here is different, a dark grey, but the portal behind them is almost identical. Even as the energy behind them dissipates the walls of the new ruin begin to rumble. The energy of the portal had lashed out around it and the cavern, standing for thousands of years, was beginning to crumble. The Cell rush forward, Gallach supporting a still wounded Tarl. Rushing through stone corridors they blast outwards into a dark green forest as the ruin behind them crumbles and collapses onto itself. Gathering their breath the Cell bring out the vox and attempt to contact the gun-cutter. With no reply they scan other frequencies but find absolutely no signal. Gavriel reaches out with his mind and finds no sign of astropaths within a massive range. Unsure of where they are the Cell moves through the forest, camping out under strange and unfamiliar stars. It was something those watching had never seen first hand, only read about. Ranks of men with spears held in two hands marched towards each other across an open field. Soldiers in green and black on one side, red and yellow on the other. Bearing steel armour over their house colours the two armies begin to run as they close the distance before like two waves breaking against each other they meet. Armoured cavalry sweep into one flank of the melee, lances breaking bodies and horses trampling those who get in their way. On the other flank the attempted pincer was being dulled by a line of men bearing strange blackpowder rifles. In a puff of smoke a hail of lead is unleashed on the charging soldiers, cutting down men and strange haired horned creatures in bursts of blood and bone. Their pincer incomplete the green and black soldiers begin to waver before something else appears from the forest. Standing ten times the height of a man the metal beast that emerges is elegant in design, central body adorned with noble sigils and a large coat of arms. Massive feet crush broken trees in its wake and each upper limb is festooned with a collection of deadly, and clearly advanced, weaponry. Hayl reached into his coat again within the cells of Fortress Arakon. It was still there. He had checked every few minutes since the guards had failed to find it. An unassuming little book, it was all he had taken from the doomed 'Fury Untold'. The guards had searched him twice and not found it. As his hand moved into his pocket absentmindedly Hayl couldn't help but think the book didn't want to be found. Moving through the forest the next morning the Cell moves towards the signs of battle. In an open field they find an epic and strange battle. Men wearing green and black uniforms fight with spears and blades against more heavily armoured men in red and yellow garb. Armoured cavalry charge and men fire blackpowder weapons in puffs of smoke. The seemingly feudal struggle ebbs and flows until with the crashing of trees two other figures appear out of the forest. Massive hulking metal men bearing noble sigils, the titans are locked in a fearsome battle. Eventually the green and black titan plunges a melta-spear into the heart of the other and the two pilots leave their vehicles. Drawing thin swords the pair continue the battle in person, clashing swords until the black and green swordsman plunges his blade into the heart of the other man. With their leader slain the red and yellow men begin to flee, cut down or captured as they swarm back into the forest. Seeing no other option the Cell approaches the victorious green and black army. Thankfully the men speak low gothic but the communications soon break down. The men grow hostile and soon the Cell are chained and placed with the red and yellow prisoners. The thousand strong army begins to march almost as soon as the looting is complete. It takes several days for the ranks of men and caravans to return to their home. During this time the Cell talk to their fellow prisoners. The red and yellow men are soldiers from House Hawken and had been battling the men of House Arakon. The black and green men of Arakon had been victorious and were now taking the prisoners back to their fortress. The titan leads the way back into the fortress, a feudal stone castle built to accomodate the massive steel warrior. The Cell are driven through long mud roads past crowds of watching peasants before being deposited within the keep at the centre of the fortress alongside the prisoners from House Hawken. Anxious hours pass as the Cell wait to see their predicament. They meet with the 'scion' of House Arakon, realising now that these were not the titans of the Adeptus Mechanicus but the legendary 'Knight Titans'. These knights were deposited by the Adeptus Mechanicus on worlds and often abandoned. Indeed, the meeting with a scion confirms that this world is far beyond the reach of the Imperium. The scion is arrogant and aggressive, referring to this world as "Questorus" and hinting at a long standing war between noble houses led by knight titans. Gallach reveals his sigil as a member of the Inquisition but the scion doesn't even blink, clearly no agents had been to this world in some time. When the scion leaves a ragged figure speaks up. The figure is Interrogator Hessk, a long haired man with violent purple eyes. He had travelled here with one Inquisitor Tortane roughly three decades ago. Tortane had come here to stop the Necrontyr threat but had been slain attempting to destroy the portals dotting the planet. Hesk had taken up his charge but after years had taken to mapping the portals, unable to destroy them. Hessk helps the Cell escape the dungeon, moving up into the Fortress to retrieve their gear. Higher up they find red robed men that appear to be unaugmented servants of the Adeptus Mechanicus. The Cell retrieves their gear but are forced to kill some of the Sacristans men in order to keep up their secrecy. Moving back through the corridors Gallach runs into the scion who had visited them in the dungeons earlier. Drawing his blade Gallach clashes swords with the man before a sizzling plasma bolt from Gavriel takes the man cleanly through the chest. Hayl summons a ball of fire in a nearby barn and as the soldiers of House Arakon struggle to quell the blaze the acolytes leave fortress Arakon. Moving out into the forest they make camp while Gallach steals some four legged mounts from a nearby farm. Mounting up with the heavily wounded Tarl they make their way away from the fortress into the forests of Questorus. While camping that night Hessk informs the Cell of the situation on Questorus. The noble houses had been battling for decades, led by their knight titans. Hessk had found and destroyed a half dozen Necrontyr gates and knew of dozens of others. It seemed that he had realised the futility of his task and gone native, working as a mercenary in an area known as the Frontier. This is where men of violence not assigned to any house gather away from the wars. Gallach introduces himself to Hessk as an Inquisitor, using the slain Malachi's rosette to the surprise of his fellows, and the group begin to make plans. Hessk is aware of a Mechanicus structure on one of Questorus' moons but without the ability to contact it he had been unable to determine what it is. The Cell decide to prioritise this structure, heading towards House Hawken intending to use their renowned telescope to determine the purpose of the moon structure. Mounted upon the beasts dubbed "Questorus Grox" the group rides north through the vast forests of Questorus. Interrogator Hessk leads the way, regaining some of his characteristic swagger now that he is back serving the Inquisition. They travel for several days through the forest on the grox before the true nature of Questorus begins to reveal itself. During the night the camp is beset by strange creatures, part man and part beast. The creatures are easily cut down with bolt rounds and bursts of flame from Hayl but upon inspection are revealed to in fact be mutated humans. Hessk explains that these stable and consistent mutations are the work of chaos beasts known as 'Leshen'. It seems that with the near constant war on Questorus the planet has a larger than usual warp presence, with sorcerers and these Leshen dominating vast swathes of the land outside of the fortified cities. Hessk explains the Leshen have the ability to mutate people at will and with great control. These muscular blends of man and beast are one of their favoured forms, named the "Brahmin". Hay collects some mutant blood for his records and the agents break camp, remounting and heading off as the bodies of the beastmen burn behind them. Moving into the mountains days later the Cell are forced to butcher their grox, the lumbering forest creatures unable to scale the treacherous mountain passes. It is slow going through the mountains, cold and wind bringing travel to a crawl as the Cell cross hazardous crumbling bridges and icy peaks. Crossing one such bridge Tarl and Hessk are swept off by a gust of wind and plunge into a ravine below. Gallach rappels down and brings the men back but their wounds slow the party down even further. It is only the biomantic powers of Gavriel that keep the group going at all, wounds knitted over with warp energy. Camping out in a cave for the night Gallach uses the butchered grox fur to create cloaks and the next morning the Cell begins their descent. They dodge blue and yellow clad patrols from House Lakar and even witness a large battle at the bottom of the mountains. House Lakar forces battle against peasants who had revolted against the house. The more well trained soldiers prevail and the Cell take caution to avoid the battle site. Reaching the foothills of the mountains the group continues through the massive forests until eventually the smell of salt hits their nostrils as they arrive at a sandy bay. Moving along the bay Hessk leads the group towards what appears at first to be an abandoned village. The village, occupied only months earlier, seems to be literally falling apart. Wooden houses rot and beached animals give off an abhorrent odour. The group discovers the village is occupied by strange fish-mutants but decide to ignore them, every one of them sensing the pure warp energy in the air of this place. Hayl and Gavriel are in pain with the saturation and once Gallach procures a small sail boat the Cell sets out. As they leave the fish-mutants come out of their houses and begin to smash their spears against the ground. Chanting over and over in a strange tongue the Cell soon leaves the group behind, moving out into the bay towards a massive psychic presence that Hayl had pinpointed. Sailing onwards a strange mist forms around the boat and the sails fall dead. As an unearthly shriek fills the air an ethereal figure manifests on the deck of the ship. The multi limbed creature walks forward calmly as it manifests on the deck of the ship. Drawing weapons the Cell unleash an unholy fury of fire onto the beast. With each hit a field of purple energy flares, warp energy manifesting to protect the creature and further saturating the area with psychic residue. Rain begins to fall as the weather reacts to the energy being unleashed. As the creature advances Hayl throws up a wall of energy that blocks the creature's blows. His normal white energy is tainted yellowy-red by the presence of the foul creature. As another wave of bolt rounds hit the creature it's shield flares again and from the realm beyond something else manifests. A creature of machine and plague, the monster that appears is a cruel mockery of a servitor. Whirring cogs move in rotten and pus filled flesh and massive steel weapons still out, coated in rust and blood, from it's body. The new daemon surges forward, ripping the fiend to shreds with a single blow from its massive chain fist. The Acolytes stagger backwards, pouring ammunition into this new monster without success. Eventually it is Tarl, Gallach's bodyguard, who takes the creature on. Slashing at it with his massive sword he cuts off a limb. Sensing the weakness Hayl pulls out his holy aquila and begins a rite of banishment. As Tarl parries and holds off the daemon Hayl shouts aloud in high gothic before with a simple pop the creature ceases to be, leaving only a rusted screw begind. Hayl picks up the screw and Gallach quickly adjusts the sail to leave this tainted place. It is a few days more of travel before the group arrived at the White Cliffs of Hawken. They encounter only one other ship in that time, a House Taryn raider that tries to board them. Hayl reacts almost instantly, burning the ship in a conflagration of fire and sending the men leaping into the sea. Unwilling to have word of them spread Gallach orders the ship to turn around and the survivors are executed, an act the necessity of which is matched only by it's barbarity. A day after the destruction of the ship the Cell arrive at the White Cliffs, leaving their boat behind and clambering up the massive limestone cliffs. Camping on the edge of the cliffs the Cell have a chance to rest, Hessk talking to Gallach about the traditions of House Hawken while Hayl does private study with the daemonic relic he had collected. He references a small book in his pocket often and takes pains to hide it from his fellows. The following morning the Cell pass on the inside of the Wall of Hawken, a massive stone defensive wall that protects their lands from outsiders. The Wall, famously built by Knight Titans, is massive and has kept Hawken in the fight against stronger houses for years. Stowing their gear on the outskirts of the forest the Cell moves into Fortress Hawken. Based around an STC structure that is identical to that at House Arakon the fortress is vast and heavily guarded by red and yellow clad warriors. Following Hessks instructions the Cell enters the sewers of the city, moving to underneath the tower where the Hawken sages dwell. Sneaking up through the lavatory chute the Cell gains access, stealing purple robes and moving through the tower unimpeded dressed as sages. In the tower scientific research fills large stone rooms while a massive library contains many books detailing the history of Questorus. The group stay in the library for the most of the day, learning about the history of Questorus and confirming at last that the planet exists outside of the known limits of the Imperium. That night they access the archeotech telescope at the top of the tower. Hayl aligns the ancient machine and points it at Questorus' moon. Hessk had been right, there was indeed a structure on the moon. 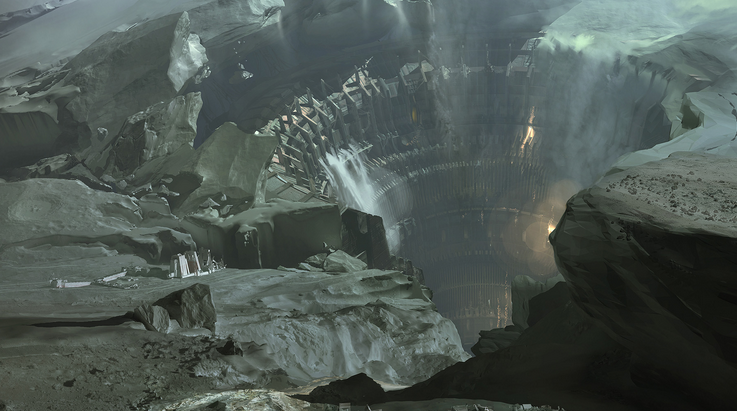 It is an STC structure favoured by the Adeptus Mechanicus and appears to still be active. It is sending a constant stream of data to Questorus. Their questions answered the Cell leaves the tower, considering how they could contact those within the moon station. In the common room of the Exalted Boar inn the Cell discuss their next move. Realising the only machines capable of receiving the message being sent by the moon are the Knight Titans they decide to gain access to one of the mighty war machines. Producing a hand drawn map from his pack Hessk informs the group that the Knights belonging to the houses would be too difficult to access, prickly and untrusting as the Scions tend to be. The only Knights they might be able to access dwell far to the south, in the lawless lands known as the 'Frontier'. It is here that outlaws and mercenaries gather away from the rules and wars of the houses. Moving down to the docks Hessk arranges a meeting with Captain Cenric, a House Taryn trader willing to make passage to the Frontier. His payment is a strange winged lizard dwelling within the House Hawken tower. Disguising themselves the Cell procure the creature, along with numerous other beasts that Gavriel takes a keen interest in. Delivering the beast to the Diligent the Cell load their equipment aboard and soon the green-sailed ship is breaking port at Hawken. The ship sails north around the cliffs of Hawken before veering west. Cenric carries materials and weapons from Taryn to trade in the Frontier and the mood of the crew is good even as the weather grows harsher. Gallach spends his days training with the Captain on deck, the chopping cutlasses of the crew similar in style to Gallach's own power cutlass. Gavriel spends his days below deck, communing psychically with the captured creatures and beginning to gain the ability to control them. Of Hayl little is seen, the sage shutting himself in with the books he recovered from the Fury Untold before her untimely demise. Passing down the west coast of Questorus the Diligent passes the legendary 'Spiral', a vast aquatic anomaly that halts almost all trade down this coast. But Cenric is a captain of prestigious skill and the Diligent passes through the Spiral without suffering too much damage. Some week after setting out from Hawken the Diligent makes port in the Frontier, a collection of ships bearing different sigils watching them carefully as they pull into a shanty port on the far southern coast. In the centre of the town sits 'The Palace', an STC structure not unlike that at the heart of the fortresses of Arakon and Hawken. Cenric says his farewells and Gavriel reluctantly releases the local beasts he had captured and trained over the journey. Donning their local garb the Cell moves into the town, Hessk leading them to a local watering hole the Dragon and Serpent. Speaking to the locals and purchasing some of their unpleasant local liquor the Gavriel discovers that in the nearby area there are a half dozen of so Knights. Most live around the Palace and owe allegiance to the Frontier as a whole. Only one stands apart from the rest, Cuthbert. Later that afternoon the Acolytes set out of town towards Cuthbert's location, camping that night in Questorus' dark forests. A strange nocturnal hunter troubles Hayl during the night but in a burst of purple and yellow flames he sends it screeching back into the darkness. The next morning the Cell approaches Cuthberts camp, a dotted collection of tents and wooden structures inhabited by nearly one hundred souls. The soldiers train during the day while many followers and hangers on tend to the needs of the camp. The group find Cuthbert just outside his camp, his soldiers running practice drills of infantry against titan. The group watch for a while before the drill ends, Cuthbert leaping from his war machine and approaching them. A handsome man of over six feet, his mop of blonde hair and scarred face give him the air of an archaic swashbuckler. He greets the group suspiciously as they make their pitch. Sitting in the shadow of Cuthbert's fearsome machine Hayl explains their position to the Scion. He poses as a tech-adept, outcast from his house because he discovered technology undiscovered within the Titans. Gavriel, Gallach and the others pose as mercenaries he had hired for the journey. Cuthbert appears to buy this story, cautiously allowing Hayl access to his Titan. Within the machine spirit data-streams Hayl indeed finds the ability to communicate, disabled long ago by the Adeptus Mechanicus when they left the Titans here. Gallach links his micro-bead to the Titan and takes an excited Cuthbert to run tests, the Scion seeing the combat benefits of instant communication almost at once. While the pilot is distracted Hayl fulfils his true purpose and accesses the Knight's orbital grade communications array. He receives a strange encrypted message spoken in an impossibly deep voice. It refers to him by name, compelling him to seek the Adeptus Mechanicus bunker beneath the Palace and to travel to Questorus' moon. With no other clues to go on the Cell travels back to the Frontier city, the curious Knight Scion Cuthbert in tow. In the wake of Cuthbert's orange and black Titan the Cell ride grox up to the Palace. The defending Titans, all painted a sky blue and bearing the sigil of a sparrow in flight, step aside to allow Cuthbert access. He speaks to the pilots a while, the three gathered here making up the Frontier Council. The Scions Godiva and Hrodghar allow Cuthbert access at once out of respect for his martial prowess but eventually his silver tongue brings around even the sullen Leofshes. Moving down through the crumbling plastone hallways of the Palace the Cell eventually reaches a sealed crimson door shaped into the cog of the Adeptus Mechanicus. The inhabitants of the Palace had tried for years to open the doors but none had ever managed to move the lathe steel. Hayl interfaces quickly with the door, his security override machine spirit easily overpowering the ancient spirit of the door. Locking the door behind them the group removes their Questorus disguises and don their armour and weapons. Cuthbert's eyes widen at the carapace armour and heavy armaments but he doesn't comment, merely drawing his own sword and rushing ahead into the long abandoned corridors. Moving through dank corridors lacking in even the slightest patch of dust the Cell makes their way through a maze of tunnels. Gun pods and combat servitors stagger to life to defend the bunker but most are easily blasted aside with bursts of psychic energy from Hayl or Gavriel. Gallach often runs ahead to draw fire while Gavriel's green bio lightning or Hayl's increasingly putrid yellow flames destroy the bunkers defenses. Eventually the Cell arrives at an abandoned hanger, dozens of grav vehicles docked here awaiting Adeptus Mechanicus servants who had never returned. None of the ships are operational but with the technical know-how of Hayl and the salvaging skills of Gavriel and Gallach one of the ships is soon loaded into the firing tube and ready for flight. Magnetically launched through a tube the ship soars out of the earth, splashing from beneath the great lake north of the Palace. Zooming over the Frontier the sleek black vessel breaks atmosphere and heads towards Questorus' blue moon. Gallach controls the vehicle entirely by though, his MIU interfacing with the archeotech controls with ease even after all this time. Soon the lander is docking with the construct on the moon and the void-suit clad Acolytes are moving through void-sealed corridors in the abandoned facility. In the facility bridge they would find their summoner, a vast red robed figure interfacing simultaneously with dozens of cogitators and systems placed around the bridge. The red figure turns and watches the group approach with green spider-eyes, introducing itself simply as 'Dragos'. The creatures manners make Gnaritas look like a statesmen but with curt conversation Gallach soon gets to the heart of the matter. Dragos had once been a servant of Inquisitor Golspire, a figure of disrepute in the Calyxis sector who had come to Askellon to serve Malachi and the Patternari. Dragos claims to serve Golspire no longer, having ascended from the mortal plane. During his final mission in Calyxis Dragos had interfaced with the heretical machine of the infamous Haarlock, fully integrating himself with the logic engine and leaving mortality behind to become something more. He explains that he had stepped through the warp to this station some year ago and had awaited the Cell's arrival since then. He speaks in the same riddles as Malachi, informing them that he is another guide on their path to saving Askellon. As Dragos restores air and gravity to the station he explains to the Cell their great task. The moon on which they stand is no moon but a vast Necrontyr Warsphere. A "tomb ship" that is set to teleport into the very heart of Askellon as one did long ago. The last ship was disabled long ago, drifting and overrun by Orks until it settled at Port Aquila and become known as the 'Atticus Compound'. But this sphere was something else entirely. It was the homeworld of the Akhenaton Dynasty, an ancient sect of Necrontyr who once ruled Askellon and would do so again. The Adeptus Mechanicus discovered the sphere and tried to destroy it, sending all their might into the centre of the world from which they never returned. They were slain by the automated defences of the Tomb Ship, protecting Phaeron Iahmesu, the 'King of Cowards', immortal ruler of the Akhenaton. Opening the view-ports Dragos reveals what the Adeptus Mechanicus left behind. In orbit on the dark side of the moon is a ship beyond the scale of comprehension. A red and black beast bristling with gun ports it is the largest ship any present had ever seen, an Ark Mechanicus Battleship from the original expansion into the stars. Now empty but for the most basic servitors it sits above Questorus, silent for 30,000 years. It is the Northern Regalia and it would be their salvation. Gallach walked the empty halls of the Northern Regalia, auto-sentries and doors unlocking as they sense the command codes imprinted in his bionic arm. What few servitors remain are more machine spirit than mind and acknowledge their new commander without incident. Moving through dark steel and crimson halls he arrives at the bridge. The murder-servitor guards stand at ease, vigilant after all this time, as Gallach takes his seat on the Regalia's command throne. As his MIU interfaces with the long dormant systems he hears the voice of this ancient abandoned warrior-machine. The creature hovers above the ground, long metal arms dangling towards the obsidian floor, backlit by an eerie green glow. It's thousands of eyes scan and investigate the ruined mining vehicle in an instant even as it's claws get to work repairing the burned outer crust of the Tomb Sphere. The Cell sits with Dragos for a while, prying his powerful brain with questions. It seems that the Necrontyr attack on Askellon would come from without as well as within. As Tomb Worlds awaken across the system they would be met with the forces amassed by the Patternari while invasion fleets from outside the system would be met at Port Lokhart and other strengthened stronghold. This Tomb Sphere would awaken first, housing within it the leader of the Dynasty; Phaeron Iahmesu. Dragos tries to explain how the Sphere would teleport to the heart of Askellon but his explanations go far over what even the learned Hayl can understand. Understanding the doom that threatens Askellon more the Cell move on to options. Destroying the Sphere would not be possible even with the massive firepower the Nothern Regalia possesses. Even destruction of faster than light travel or power would be healed over time, so powerful is the regenerative ability of the Necrodermis. Only two targets would cripple the Necrons ability to attack. Destroying the memory banks would make all but the most sentient Necrons wander mindlessly while destroying the Phaeron himself would take the drive out of the army. As Hayl stays with Dragos Gallach, Gavriel, Tarl and Hessk take a lander to the Northern Regalia. They walk its empty and immaculately clean halls, defensive programs shutting down after they detect the command codes implanted in Gallach's bionics. Gallach interfaces with the machine spirit of the ship, a powerful being that refers to itself as "Prime". It rips the information it needs from Gallach's mind directly, learning of the Imperium and the objectives that drew the party to it. Prime agrees to help the group, eager to be back to war, but says that before his departure the Arch-Magos of the ship had locked down the primary systems. Only with the Arch-Magos' pass codes would the Regalia be able to operate fully again, but the Magos had fallen deep in the Tomb Sphere. To assist them in retrieving the remains Prime opens up the ship's armoury and within the Cell finds treasures beyond their imagining. The ship, lost to time for 10,000 years, holds weapons and armour from the so-called dark age of technology. Within is an STC fabricator, a massive machine that can construct any object if the correct format is given. Within the armoury itself are plasma and power weapons of great strength as well as miniaturised versions of shipboard lance technology. Dragos begins work to create a device to track the Arch-Magos while the Cell prepare for the insertion into the Tomb Sphere. Gallach and Tarl have extensive bionic work done, installing archeotech exo-skeletons that vastly increase their speed and strength. During this time Gavriel travels to the communications chamber of the Regalia and with Prime's help rigs up a makeshift Astropathic chamber. It would take him days but Gavriel sets to work sending a message to the Astropaths on Juno. Askellon must be warned about the coming storm. Meanwhile in the depths of the ship Hayl meticulously scrimshaws a room with protective wards and pentagrammic sigils. A fresh-forged staff from the fabricator sits at the centre of the room and over hours Hayl begins to perform a ritual to summon and bind a daemon. A ritual that had haunted his waking dreams for weeks, slowly but surely put into his mind by the 'Liber Malleus Accersito'. Gallach flies one of the grav ships down to Questorus and picks up the Knight Scion Cuthbert, easily convincing the warrior that this would be a great adventure. Upon returning to the ship he presents Cuthbert with a power rapier and suit of carapace armour fresh forged from the Regalia's STC designs. Now prepared the Cell boards a ship and travels to the surface of the Tomb Sphere, Hayl carrying a strange warded staff that seems to corrode anything it touches. Travelling through the Mechanicus facility the group soon arrives at a massive mining pit. Long rotted servitors man dilapidated machines that once bored through to the Tomb Sphere. Down a massive grav-lift the group finds a wall of smooth obsidian, impassable and barely damaged as Tarl smashes it with his new power fist. Guessing that the Necrons must have a way of travelling through the wall the group set up an old melta drill. The machine whirs into life, biting chunks out of the wall before eventually even its powerful cutting blades run dull. A few minutes later, as predicted, the Necrons come to investigate the disturbance. They come in the form of a large floating creature, many limbed and the same gun-metal grey as the Necron warriors. As the creature moves to investigate the disturbance the group moves forward, Gallach blasting at it with his Graviton gun. Balls of elevated gravity smash chunks of the creature as Hayl finds his psychic powers lessened by some sort of null-field around the Necron. Drawing the wounded creature towards the wall the group move through it, destroying the Tomb Spyder as it appears on the other side. As the metal of the creature disappears the group reload their weapons and move deeper into the facility. The Tomb Sphere is made of a strange dark metal similar to the construction of the Necron soldiers and is smooth beyond even the most advanced technology. The group move through gargantuan underground areas, walking for miles through halls backlit with a strange green glow. Hundreds if not thousands of Admech bodies lie within, burned by Necron weapons or ripped apart by heavy blades. Servitors, Skitarii and even machines lacking any organic matter make a trail for the group to follow before Dragos' tracking device bleeps into life. Moving into small angular and oddly shaped rooms the group follows the Arch-Magos' signal to a large sunken area covered in chemical fog. The signal leads to below and Tarl dutifully rappels down to recover the remains. Panicked shouts emit from the fog before Tarl returns, leaping up the wall in a panicked retreat. He had been attacked by something in the fog, something unknown and terrifying. The group follows him down this time, moving through the freezing area with weapons raised. Suddenly from the mist creatures leap forth. They appear at first to be creatures of flesh but with a terrible realisation it becomes clear they are something else. Necrons who had adorned their metal bodies with the decayed and dried flesh of those they kill. They rush forward, lashing out with razor sharp claws that take Hayl's leg off cleanly at the knee. As Hayl blasts out at them in pain Gallach rushes forwards and retrieves the Magos' remains. As hundreds of the flesh-clad Necrons move slowly forwards the group retreats up the wall, leaving the misty hell behind. Moving out of the Tomb Sphere the group pass back through the Obsidian wall, the remains of a Necron slain by Hayl allowing them access. Travelling back to the Northern Regalia they plug the Arch-Magos' internal cogitator back into the ship and with Dragos' help Gallach begins to formulate a plan. The Regalia would fire on the Sphere, drawing out its current defenders while the Knights of Questorus would commit to an assault on the Sphere directly. The hundreds of Knight Titans and men at arms would do battle in the vast halls of the Sphere with the awakening Necron armies. With these two distractions pulling away the Necrons the Cell would move in at speed to destroy the Memory Drives and the Phaeron himself. With the destruction of his memories and his material bodies the heart of the Necron threat should be torn out and the threat to Askellon quelled. With the plan taking focus the group moves to secure the assistance of the Knights of Questorus. Cuthbert travels back to the Frontier and convenes a meeting, promising the support of the Frontier Knights within days. During this time Gavriel and Hessk travel to the great houses of Questorus and organise meetings in the coming days. Gallach travels to the Frontier and equips Cuthberts men with weapons and armour from the Regalia, they would be accompanying the group for the assault. Armed with Skitarii carapace and archeotech hellguns they should be more than a match for the Necron defenders. During this time, as the Cell prepares for the assault on the Tomb Sphere, Hayl stays aboard the Northern Regalia. Research in the Regalia's ancient data-stacks had led him to believe that a suitably powerful and ancient Machine Spirit could take the place of a soul in dark rituals and within his warded chamber at the bottom of the ship he conducts dark and forbidden rites. An Ursarax combat servitor stands at the centre of the binding circle, a fearsome machine created by the Cult Mechanicus for war. It stands bound, marked with dark runes and coated in the liquid metal of the Necrons, carefully extracted over years by Dragos. Reading arcane words from his book and channeling energy directly from the warp Hayl brings forth a creature of pure darkness. In a blinding explosion of blood a creature appears, red muscled flesh poking forth from bronze armour and wielding a midnight black blade. In his mind Hayl hears the creatures name repeated over and over like a mantra. "Zhedzuth Wrathborn. Zhedzuth the Slaughterer. Zhedzuth Bloodfrenzy". With all of his will Hayl binds the creature, forcing it to submit to him and pushing its soul directly into the Ursarax. Wild energies flail around the room and as the smoke clears only two figures remain. The Ursarax glows green from within, it's metal armour flowing and changing as black claws grow from within. Deep within the halls of the Northern Regalia, in a room coated in blood and arcane symbols, the daemon-machine bows to its master. The Knight Scions stand a few metres apart, eying their long time enemies warily. Each bears a suit of black carapace armour bearing their own sigil and a thin power-rapier forged by the Fabricator aboard the 'Nothern Regalia'. They would get closer and closer to each other as they venture into the Tomb until, when battling the Tomb Scarabs, they would fight back to back. Reuniting back aboard the Northern Regalia the Acolytes return to the ship's bridge even as Prime pulls the ship into high orbit above Questorus. Appearing in the skies the vessel sends panic through the citizens of that continent and makes the Scions think twice about their laughed derision of the envoys that had appeared before them. Not long after the group are aboard a crimson and black gunship, Gallach steering the ancient vessel down to the planet. Arakon are the first house to be visited and Cuthbert's knight is dropped unceremoniously in the front gardens of the palace. The rest of the group descend, quickly swarmed by the green and black clad armsmen of House Arakon holding spears and rifles with white knuckles. The King-Scion of Arakon sits on a throne forged of the swords of the men he has defeated in single combat. He mocks Gavriel and Gallach's explanations of the Tomb Sphere and is about to have them thrown out when Cuthbert speaks up. He talks of the battle beneath the moon's surface, of the foul creatures and of the numbers he alone witnessed. Although dishonoured, Cuthbert is a knight and so the King-Scion agrees to listen. Although he believes Cuthbert the King-Scion needs evidence of his own and agrees to send his son, Scion Dunstan, to accompany the group and see the Necrontyr for himself. It takes nearly a week to repeat this process. Each time arriving with Titans and each time declaring the threat to the King-Scion of the houses. The discussions take time but get easier as the week goes on. At House Hawken a disguised Gavriel subtly imprints the idea into the King-Scions Archivist advisor and manages to ease tensions before the emissary from House Arakon restarts hostilities. At House Lakar the King-Scion needs a peasant rebel stronghold discovered and dealt with before he will spare even a single man for the war. The Regalia's augurs easily find the rebel outpost and the gunship destroys the fortifications with a single devastating salvo. The remaining rebels surrender and House Lakar sends an envoy. At House Taryn the King-Scion demands a duel for the honour of meeting with him. Cuthbert easily defeats his champion in single combat and soon House Taryn has joined the emissaries. Each King is given an ornate power sword forged on the Regalia bearing his own sigil, while the emissaries are outfitted with carapace armour bearing their house sigil. Finally with all the Knights of Questorus represented the group flies to the moon and enters the Lunar Facility. Moving through the large obsidian wall the group doesn't make it far in before they attempt to draw out the Tomb's defenders. The Scions are awed by the sheer scale of the hallways and draw their weapons as the ever-present sense of dread begins to overwhelm them. Setting off a melta-bomb a part of the wall is blasted away and sure enough the defenders appear. Two Tomb Spyders hover forwards with many clattering legs while beneath them a swarm of smaller beetle like creatures follow their masters. As Gallach opens fire with his graviton gun Hayl's war-machine rushes forward, glowing internally and hovering along the surface of the sphere. The swarm moves past it, the Knight Scions drawing their new power swords and engaging the swarm. As they chip away at the overwhelming numbers a more intense battle takes place. The Daemon-Engine smashes its warp claws into one of the Spyders, ripping it asunder. But even as the first creature starts to reform the second picks up the engine and tears it in two. Psychic energy splashes across the chamber and stuns the Necrons as the group falls into a quick retreat, the two Tomb Spyders and the swarm following slowly. A shuttle takes each of the envoys back to their houses, accompanied by one member of the group. With the evidence pouring in each King swears to give his forces over to protect Questorus. The communication systems of the Knights are unlocked and over the following weeks the armies of the Great Houses of Questorus are raised. Civilians are conscripted into militia and trained with spear and blackpowder while the Knights, so long at war, are given time to repair and train for the coming war. During this time shuttles from the Regalia go to a fro from each house, collecting prisoners and those who refuse the draft to be taken back to the ship and turned into servitors. Soon the skeleton crew of the ship are renewed, working alongside the automatons and machine spirits to bring the mighty war ship up to full capacity. During this month Gavriel and Hessk travel abroad, taking Cuthbert and envoys from the great houses to visit the other continents of Questorus. Dozens of islands each hold four Knightly Houses and one by one they swear their aid in the coming war. Some require visits to the moon but many more will go on the word of the envoys from Arakon, Hawken and Taryn. Over a month the armies of Questorus rally for war on a scale not seen in 30,000 years. During this month Hayl gets to work again within the deepest reaches of the Nothern Regalia. He tweaks his summoning ritual to summon a more powerful beast, seeing how quickly his last was destroyed by the Necrons. Rituals invoked and blood offered a daemon-beast bursts forth again, this time a hound of doom eager for blood. Hayl's bindings flare once before burning away but with a burst of holy light he summons abilities not used for some time and banishes the creature back to the hell from which it came. For his next attempt Hayl would be even more diligent. Days and weeks of preparations would follow, a custom fabricated Ursarax created by the ship with hexagrammic wardings built into the very steel from which it is built. The original summoning room is destroyed with flamers and a new one marked intricately with wards and washed with holy water. Finally with all of his knowledge and willpower Hayl performs the summoning again, binding a haired beast of chaos into his purpose built Ursarax. This time the daemon-engine gives off no smell of sulphur or strange lights. It appears to be a normal Ursarax but burns with a daemon many times more powerful than the others Hayl has summoned. As the preparations draw to a close Gallach puts the final details on the plan. Simulations are run aboard the Regalia and the hallways of the Lunar Facility are widened to allow the massive armies through. A secondary entry point is excavated and Cuthbert's soldiers brought aboard the ship for even more training. Dragos prepares melta warheads to destroy the memory banks of the Sphere and rigs Necron passage tokens to assist the group in passing through the obsidian walls of the Tomb Sphere. The attack was to be a simple one. The Regalia would fire on the Sphere and draw out the defenders while the forces of Questorus did battle beneath the crust of the moon. Over 100 Knight Titans had been mustered and over 500,000 men-at-arms and militia would support their Lords. A mighty army to meet the rising strength of the Necrons. But both of these battles would serve a distraction for the insertion of the Inquisitorial forces. 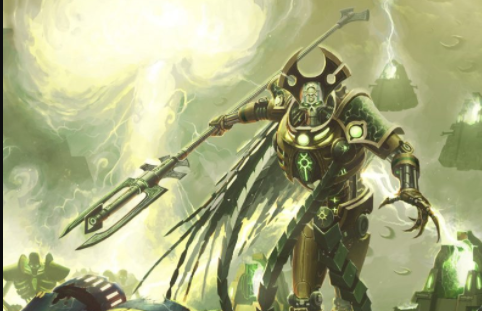 Lord Cuthbert and his men-at-arms would accompany the remnants of Cell Medusa on an incursion to destroy the memory banks and assassinate the Necron Lord, ending the threat once and for all. Aboard the Nothern Regalia Gallach runs the simulations again, tweaking the strategy slightly from the last dozen iterations. Even with all of Dragos' knowledge and the predictive powers of Prime the outcome of the battle to come was uncertain. Would the Knights hold the line? Would the Necron Lord awaken as soon as the Sphere was threatened? He runs the simulation again and sips a glass of amasec found ageing aboard the Regalia. Whatever else happened the chance to taste the 30,000 year old aged spirit was almost worth all the pain and bloodshed. With ready signals from both attack forces Prime begins the bombardment. Macrobatteries fire for the first time in 30,000 years, lance blasts and balls of fusion energy searing down towards the Tomb Sphere. Newly servitorised civilians from Questorus reload and vent the cannons as the bombardment reaches a fever pitch, burning away rock and debris and revealing the obsidian metal of the Tomb Sphere beneath. Almost instantly the defenders of the Tomb rush out. Waves of Tomb Spyders and long snake-like Stalkers fly through the void towards the 'Regalia' while behind them the voidships of Necrons deploy. Small crescent moon shaped vessels dart ahead of larger pyramid-like warships. The Necron defenders and voidships, nearly ten times the number predicted, swarm away from the Tomb Sphere even as the defensive cannons of the 'Northern Regalia' begin to fire. Right on cue, as the dark red sun rises over Questorus, the Northern Regalia begins its bombardment on the dark side of the Tomb Sphere. Massive turbo lasers and fusion cannons raining a cataclysm of fire upon the small moon. Soon the rocky outer crust is melted and burned away and the ship's melta cannons get to work, blasting away chunks of the Necron obsidian beneath. Almost as soon as damage is done to the Necrodermis the defenders of the Tomb Sphere react. Tomb Spyders swarm from a thousand unseen openings on the Sphere while behind them massive snake like Tomb Stalkers drift through the void towards the Regalia. Lastly the aerial forces of the Necrons deploy, crescent moon shaped attack craft supported by larger 'Hatchet' boarding craft. They blot out the Sphere with their numbers and launch towards the Regalia, ten thousand defenders screaming out for the blood of those who would dare attack their home. Even as the defenders mass for a charge on the Northern Regalia the army from Questorus attacks. They march in house groups, men at arms with primitive weapons marching behind the Titans bearing their colours. Marching through obsidian gates across the surface of the Sphere they walk through the massive support-less halls of the Necrons and meet them in open battle. The Necron army are without number but the Scions are battle hardened warriors who know their craft. The hundred-odd Titans take the lead, emerald energy beams from Necron weapons bouncing off their outer void shields or thick adamantine armour. The Titans return fire, mega-bolters or fusion cannons destroying dozens of Necrons with each shot. The Titans march forwards, smashing aside units of Necrons with their chain weapons or turbo-fists while any who survive their onslaught are mobbed by the swarming militia of Questorus behind them. As the battle rages Titans fall by pure weight of numbers or as hovering necron warmachines bring heavy weapons to bare. But as each falls the others close ranks, a display of surprising military discipline from such ambitious and selfish warriors. The Necrons mass in straight ranks, rifles spitting out emerald death as metallic scarabs swarm beneath their feet. Above them massive pyramids disengage from the roof and begin spitting out bolts of energy the size of a tank, blasting apart Titans is showers of shrapnel and flame. While fierce battles rage overhead and elsewhere the Inquisitorial forces begin their incursion. Led by Cuthbert's massive orange painted Knight the group walks among Cuthbert's 100 men-at-arms. With the bulk of the Necron army away defending against the Questorus attack in takes nearly half an hour for the group to even engage any hostiles. Led by Dragos' augur map they move deep into the Tomb Sphere in search of the memory banks. But when they do engage the enemy they find themselves up against the elite of the Necron army, semi-sentient warriors of the Necron Lord's personal retinue. The first groups of enemies are easy slain by the hulking Titan, the remnants finished with beams of purple-brown energy from Hayl or quick shots from Gallach or Gavriel. Those that get too close are crushed in Tarl's powerfist. But soon the enemy brings heavier weapons to bore. The duel-flayers of heavily armoured Immortals cut through even Cuthbert's Titan armour, damaging his systems and blowing off his cannon arm. The men-at-arms give a good account for themselves and massed hellgun fire cuts down many enemies. But beyond the Immortals mass a pair of Tomb Stalkers, gargantuan snake-like machines of metal and glowing green energy. Prime controls the thousands of defensive turrets around the Regalia with a series of preprepared algorithms mapping target predicted routes. Outside of the fire zones servitor piloted or drone ships do battle with the Necron forces, intricate and expert dog fights of machine on machine. 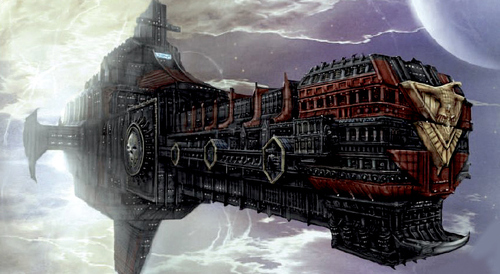 The Cult Mechanicus ships are powerful and heavily shielded but soon the Necron numbers begin to tell. Prime leaves the fighters out until their last falls before bringing his full firepower to bear again. It is an onslaught that would have destroyed a world but the pure overpowering mass of the Necron defenses break through his defences, Hatchet craft attaching to the Regalia's outer hull and disgorging squads of still awakening Necron warriors. Necrons bearing heavy shields and energised axes march through the long abandoned halls of the ship and are met by Dragos' well organised defences. Turret pods reap horrible losses upon the attackers while sections of enhanced gravity slow their movement or funnel them into kill zones where the ship's Ursurax can rip them to shreds. But despite the losses inflicted the Regalia begins to fall. Section by section, compartment by compartment. With a twinge of regret Prime steers the ship away from the Tomb Sphere. The voidships disengage as he pulls around the far side of Questorus, leaving him alone to deal with the annoying ants crawling around the insides of his mighty warship. Despite the retreat Prime did feel some simulcrum of joy at being at war again. Deep in the Tomb Sphere, surrounded by oppressive obsidian walls, the Tomb Stalkers slither towards Cuthbert and he orders his men-at-arms away, they can do no good against these beasts. As he turns to fight the two Stalkers his men move through a side corridor and the Inquisitional forces move deeper still, following the signal of the Memory Banks. Boosting forward shields Cuthbert takes the brunt of the attack on his void shield before it overloads, popping like a blister beneath the emerald energy beams emitting from the Stalkers. Rushing forwards he brings his chain blade down on one of the creatures, churning steel sparking against Necron necrodermis until eventually the blade cuts through. As his head mounted melta cannon finishes the first Stalker the second looms behind the Titan, wrapping around the might war machine and carrying it to the ground. It takes nearly five minutes for the beast to cut through the Titan's out armour, ripping inside to find the pilot long since dead. Mind overloaded by pain sensors Cuthbert had died just after setting his Titan to self destruct. The blossom of flame denies the Stalker its prize and stops Cuthbert from having to listen to his men die. Moving through ancillary corridors the men at arms move into a deep fog that covers the corridors. Screams of pain and terror fill the vox as the Flayed Ones strike, carapace armour no match for their razor sharp claws as they retrieve more flesh to adorn themselves with. Meanwhile the forces of the Inquisition push deeper still towards the Memory Banks. Hayl leads the way holding Dragos' scanning device, protected all the while by his massive Ursarax companion. He wears the black carapace of the Northern Regalia, his a golden flame sigil imprinted on the front next to an Inquisitional 'I'. He wears his hat, despite Gallach's concerns, in place of a helmet. Gallach follows behind with his plasma gun raised. Tarl walks directly behind him, both clad in the power armoured plates that make them seem more like feudal knights than the technological marvels they are. Tarl has his power fist raised and ready and carries Gallach's half dozen spare rifles and bags of munitions. Hessk and Gavriel take up the rear, both gunslingers with pistols out and scanning the area around them. Hessk carries two of the Regalia's lance pistols and wears the 'I' with some pride after his time in isolation. Gavriel's armour bears no sigil and he carries two inferno pistols, the melta weapons having already claimed many Necron kills. The group move swiftly and silently through the Tomb Sphere, eventually arriving at a room where massive pillars glow with a thousand individual blinking green lights. As Hayl hurries to set up the demolition charges more and more green lights appear in the darkness around them. Dozens of Necrons step forward from the shadows, guns raised at the interlopers. As Phaeton Iahmesu awakens from his millennia long slumber and the Tomb Sphere begins its travel towards Askellon the Necron forces within the doomed sector awaken to meet their master. Hayl's flesh boils and falls off where it is hit. The emerald energy arching from the Necrons rips flesh from the bone and sears skin black in an instant. But the creature that was once Lazarus Hayl does not fall. He barely flinches. Red energy glows from within, wounds knitting back together as molten hot steel flows from his wounds. His eyes are burned shut, glowing so brightly red that it hurts the mortal eye to behold him. Gallach: Ex-Imperial Navy pilot who returned to Askellon after the loss of his wing in the Koronus Expanse. A skilled pilot and soldier, he is passionate about the removal of chaos corruption from Imperial space whatever the cost. The veteran of the Cell, Gallach's ascension to Interrogator years earlier was followed by a number of successful missions. Gavriel Zane: After his disappearance during the mission to Desoleum Gavriel was captured by Inquisitor Grendel's agents and sent to Terra to undertake sanctioning. He returned to serve Grendel once again, his eyes gone but his aim improved. His psychic powers remain, but now a strong drive to prove himself worthy has him using them for the Inquisition. Lazarus Hayl: An ex-acolyte of the deceased Inquisitor Fallon, Hayl specialises in daemonology and the study of the arcane. A zealous man of powerful psychic ability he sees it as his duty to burn heretics wherever he sees them. Tarl: A swordsman from the Vouxis Ivory Knights who serves as Gallach's personal bodyguard. Inquisitor Grendel: The Inquisitor in charge of Cell Alloy, a mysterious and powerful man who has only recently arrived in the Askellon Sector. Grendel is reclusive, doing most of his work through his Agent Interrogator King and his Acolyte Cells. Inquisitor Sabela: A heavily bionic Inquisitor who owns the Fury Untold Destroyer. Once a pupil of Inquisitor Fallon, she has joined forces with Inquisitor Grendel in his investigations. A member of the Ordos Xenos, her research has focused on the mythological Necrontyr. Interrogator King: Noblewoman who rose to prominence in the assets of Inquisitor Grendel after betraying her family's potentially heretical business dealings. Transferred to Askellon alongside Grendel as one of his only Interrogators. Currently runs Cell Raptor, a newly reformed part of Grendel's warband. Inquisitor Caprican Malachi: A diviner of prestigious skill, believed to be one of the most powerful psykers in Askellon. He was considered too radical as an Inquisitor by Lord Inquisitor Hark and was excommunicated. It was then that he formed an alliance with Inquisitor Durran of the Ordos Xenos in an attempt to halt the rise of the Necrontyr. Inquisitor Wrex Goldspire: Originally from the Calyxis sector, Inquisitor Goldspire was part of the infamous Haarlock Incident. He subsequently left Calyxis for Askellon and joined the Patternari Cabal. Dragos: A one-time Acolyte of Goldspire's who accompanied him to Askellon, Dragos has ascended far beyond the ken of his previous master, granted insight by his assimilation of Haarlock's Engine. Inquisitor Khlor Durran: An Ordos Xenos Inquisitor driven mad by predictions he made about the rise of the Necrontyr. He died on a prison world after his mind was plundered by Gavriel Zane. Interrogator Hesk: Second in command of Inquisitor Tortane, Hesk was trapped on Questorus around 25 years ago. A gunslinger of some skill he has survived on that world and is eager to rejoin the Inquisition. Lord Cuthbert: A Freeblade Knight Scion who seeks out adventure on the Frontier. Feudal noble houses built around Imperial Knight Titans left here and forgotten long ago. 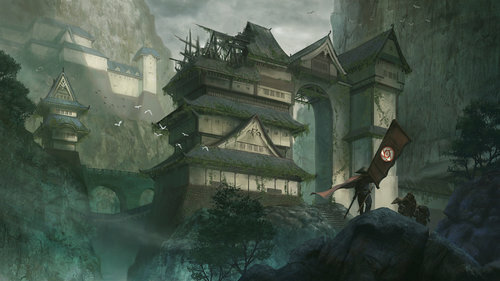 House Arakon: The largest Knightly House, currently in charge, but under challenge by House Hawken. Recent setbacks have taken land from Arakon but their Knights are the most talented in the land. Sigil of a black rose on a lime and black field. House Hawken: Wealthiest but lowest population, currently at war with Arakon and making steady progress having captured the border-city. Has the best-equipped Knight-Titans and favour ranged weapons but often needs to rely on mercenaries from House Taryn or Freeblades from the Frontier. Sigil is a boar on a split deep red and yellow field. House Lakar: Nearly as well-equipped as Hawken, but a recent peasant insurrection has weakened them considerably and the nation is suffering battle-fatigue, shutting its boarders to clean house. Typically at peace with Arakon. Sigil is a keep on a quartered yellow and blue field. House Taryn: Island-locked House of raiders and mercenaries, notoriously difficult to deal with an not exceptionally interested in conquering or unification. Noted for their lenient dealings with sorcerers. Sigil is a white lion's head on a dark green field. Frontier: Men who serve under a variety of Heraldry – any and all who have been abandoned by their house or simply set out on their own. A combination of men-at-arms and even some Knights, these men are not united but a disparate band. Not interested in conquest, most who live here only want to be left alone. 'The Fury Untold': An Iconoclast Destroyer requisitioned by Inquisitor Sabela to serve as her personal transport. It is captained by a man named Drake, who uses his Inquisitorial stipend to support a good trading practice. 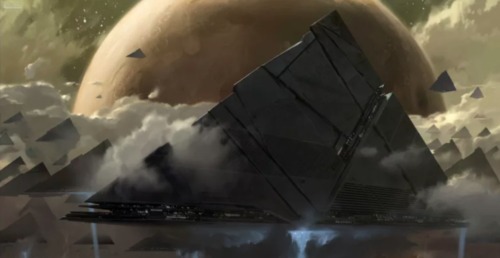 Angel KZ-8 system: Discovered by Navigator Hosue Auriga and subsequently deleted from Imperial records, this system is believed to be the base of operations for the Patternari Cabal. The Nostrodamus: A long abandoned watching station left in Angel after Navigator House Auriga fled the system. The Gate: An ancient Necrontyr ruin built around some sort of transport gate. Questorus: A strange feudal world outside of Askellon. Long abandoned by the Imperium, ancient Knight Titans do battle here alongside feudal armies. Fortress Arakon: Base of operations for House Arakon, built around a pre-fab Adeptus Mechanicus structure. The Northern Mountains: Icey peaks separating the lands of Arakon and Hawken. Home to marauding bands of Brahmin. Fortress Hawken: An STC fortress lies at the core of this heavily defended feudal keep. Lies not far from the White Cliffs of Hawken. The Tomb Sphere: Ancient palace of the Phaeton Iahmesu, the 'King of Cowards' and central command facility of the Necrontyr Akenaton Dynasty. It had been considered by the people of Questorus to be a simple moon for a millennia before its true identity was revealed. The Lunar Facility: Abandoned Adeptus Mechanicus outpost left when the Northern Regalia discovered the nature of the moon. The Flesh Pit: Home of the Necrons known as 'Flayed Ones', this pit is where any recovered organic remains are stored. The Memory Drives: An area beyond the comprehension of modern technology where the identities and memories of destroyed Necrons are stored before being re-downloaded into new bodies. The Throne Room: Housing the sarcophagus of Phaeton Iahmesu, long may he slumber.